Manila, Philippines – The Supreme Court has unanimously recommended Associate Justice Samuel Martires as the next Ombudsman, which angered some group of evangelical and Catholic theological educators. Annelle Sabanal, the group’s spokesperson said that appointing Martires is a tarnish to the institution, compromises its independence and also violates the constitutional mandate. “The appointment of Associate Justice Martires as the next Ombudsman is to besmirch the institutions and compromise its independence. Moreover, to appoint someone with such a history of enduring bias and questionable integrity violates the constitutional mandate and purposely blurs its vision,” Sabanal said. Furthermore, they also cited the instances where Martires had decided on cases with “suspicious imprudence and blatant prejudice”, the group accused the associate justice with “lack of respect for religious beliefs” – when Martires allegedly linked faith of removed Chief Justice Maria Lourdes Sereno to mental illness. “To imply that [Sereno’s] religiosity is an indication of mental illness is not based on reasoned rhetoric nor judicial examination because an expert on the matter has to look at other indicators,” the group said. “His patently biased line of questioning during the oral arguments on the connection between ‘mental illness’ and ‘invoking God as the source of personal strength’...also betrays a blatant lack of respect for faith-based communities despite the clear Constitutional guarantee mandating respect for religious freedom which as Justice of the Supreme Court he is bound to observe,” the letter reads. The group noted that Martires was subject to three administrative cases when he was still a Sandiganbayan justice – his post prior to becoming an SC magistrate. They also called out Martires over his point of view that late Ferdinand Marcos was not ousted through People Power revolution as he “opted to leave the Malacañang”. “That a Justice of the SC would insist on this revisionist interpretation of a major historical event shows a failure to meet the standard of probity,” the group added. “We therefore respectfully submit that the Honorable Judicial and Bar Council remain committed to maintaining the very high standard of probity that the Constitution imposes on those desiring to hold the position of Ombudsman,” they stressed. 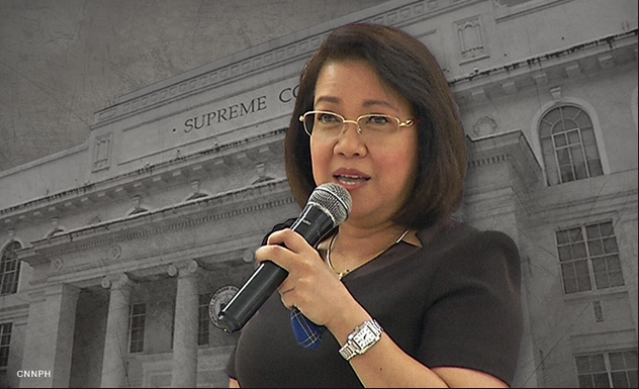 On Tuesday, 11 SC justices recommended Martires for the position to be set open after Ombudsman Conchita Carpio-Morales vacates her post.